This is a simple activity you could easily recreate at home. I'll walk you through it. With supplies laid out on table, pour salt into the shallow tub or bowl. Use masking tape to adhere opened jar to table (in order to avoid the jar being repeatedly picked up and dumped and refilled throughout the process). Tape the piece of paper into a funnel shape (will be used to transfer salt to jar). Scoop a small amount of salt onto tray. Rub chalk back and forth over the salt. Watch the salt change color! Pour the colored salt through the paper funnel into the jar (a kitchen funnel could be used here, but we did not have one wide enough at the top to catch all the salt out of the tray well). Repeat as many times and with as many colors as desired. When the layers of colored salt have reached the top of the jar, replace the lid and find a special place to store it. 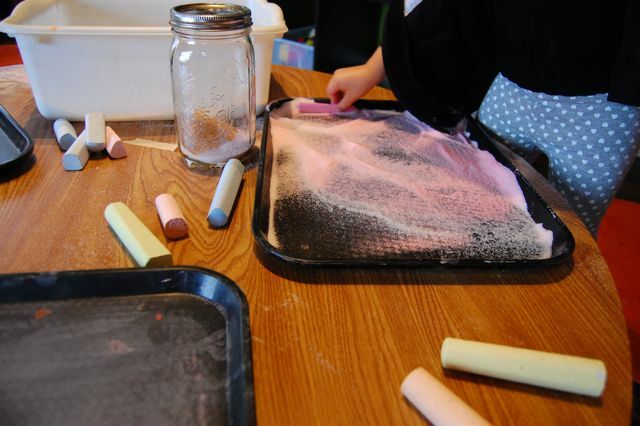 You may need to pull out several jars and a good bit of extra salt, as this activity can tend to hold a child's interest quite well. As you probably well know from reading some of our other blog posts, our art projects are focused on process as opposed to product. This activity however, naturally lent itself to providing a finished product. 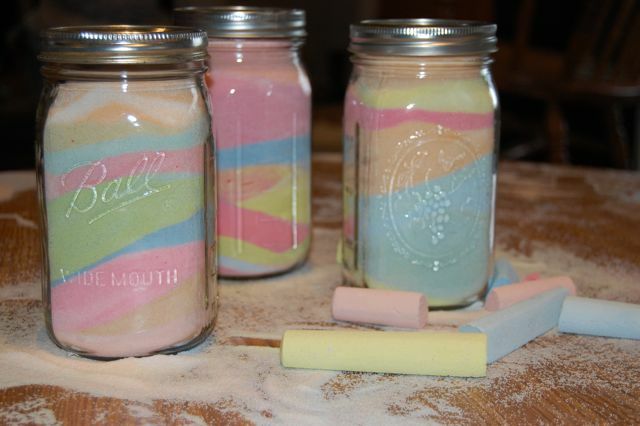 There was much mixing of colors, which in turn gave us a wider variety of colors in the jars than colors of chalk provided. The children seemed to enjoy so much each step of the process that they wanted to repeat it more than they wanted to explore alternatives in the process. I think we'll need to this activity again. 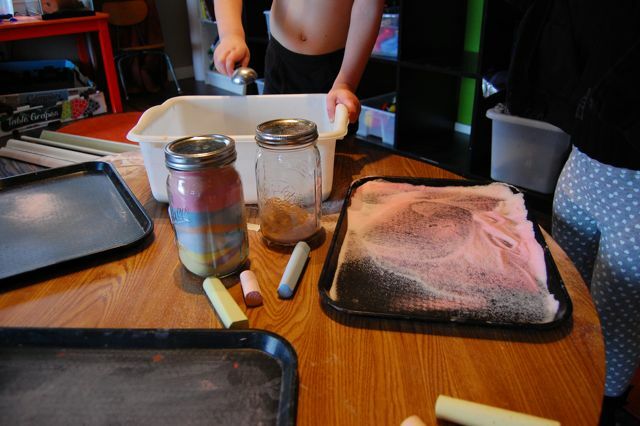 I am curious to find out whether the finished product will remain just as "finished" as the first time, or if the children will delve further into experimenting with how they can modify the activity and how that changes the outcome. Perhaps I'll even leave out the step of taping the jar to the table. That could change things a bit. As far as clean up. Remember...it's just salt. If you simply do this activity over a hard floor surface, the salt sweeps up very easily. So, just relax and enjoy the process!